7/8/12 - Museum - Paris, Musée de l’Assistance Publique - Roselyne Bachelot had made the decision a few months ago while she was still Minister under the former President before the May elections and a new government was formed. The Hôtel de Miramion (ill. 1) housing the Musée de l’Assistance Publique was to be sold. 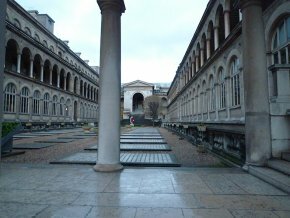 The last we heard (news item of 27/6/11 in French), the collections however were to be transferred directly to the Hôtel-Dieu (ill. 2) on the Ile de la Cité, where a larger museum would be installed. Alas, this decision by the Minister of Health, approved by Jean-Marie Le Guen , the recently elected president of the Supervisory Board of the APHP, has now taken effect. All of this happened in the stealthiest manner and we heard of it only early last June. A buyer has now been found although the name has not been disclosed. This means the museum must close down and the collections will be packed away. The removal is to take place in September by a specialized firm and the works will be stored in the meantime by a private company also specialized in this type of operation. 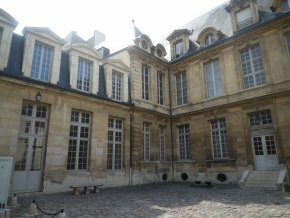 The sale of the building is not necessarily surprising, as long as the museum is indeed transferred to the Hôtel Dieu and does not effectively close. According to Stéphane Fériaut, in charge of development at the APHP and currently running this project, the museum is under no threat of closure. He told us that some of the profits from the sale of the building will be alloted to the creation of the museum in the Hôtel-Dieu, and that it would dispose of twice as much space as before. He added that it might be able to open in three or four years, that is 2016 or 2017. We in no way wish to bring into doubt Stéphane Fériaut’s assertions which seem to be made in all good faith. But apart from the fact that none of this has been made official through any kind of act or pronouncement, we must remember that last year he mentioned the APHP’s wish "to carry out this project quickly, at the latest for 2015 and if possible, even earlier, in 2013 or 2014" with absolutely no mention of any kind of closing, even for a temporary period. Yet, although the work at the Hôtel-Dieu has not even started (and the APHP has not made any official statement) the museum has already closed and its reopening at the Hôtel-Dieu has been pushed back two, even three years. Next month in September, a committee of specialists, including notably several members of the Direction régionale des affaires culturelles, is to meet in order to put together a scholarly project before the end of the year. A selection of works is to be exhibited in conditions still to be defined at the Crédit Municipal in the room on the rue des Francs-Bourgeois and traveling exhibitions will be organized as well (but which will not concern the heritage collections). The works will also be made available for loans to other exhibitions (the ter Brugghen is currently at an exhibition in Toulouse ). All of this is not a good sign for the future of this museum and we have often heard other promises made before which were never held. We hope that the new government, particularly the Minister of Culture, will be on the watchout as concerns this new affair. A quick reopening of the Musée de l’Assistance Publique (and a better presentation, notably of its artistic collections) is absolutely necessary. We should thus note the very touching unanimity expressed by both officials, one from the UMP party, the other Socialist, in this decision.